Tommy from Gorman, Texas sent us a stunning picture of his recent home improvement project using our Turcraft Architectural Square Columns. 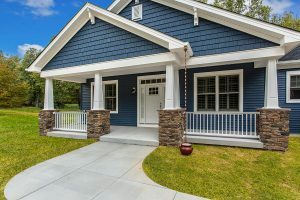 Adding character and depth to his home, the columns make the front porch a more inviting part of the home where great conversations can take place. The square column, a timeless style is now available in expanded cellular PVC for quick, easy assembly. When two coats of acrylic latex paint are applied, Classic Craftsman Series Columns will deliver years of service as promised by their Limited Lifetime Warranty against rot, corrosion, and moisture damage. Check out the full line of Turncraft Architectural columns via the link below!